Quests are set objectives that provide rewards when completed. They're kept track of in the quest journal, which can be brought up by clicking the exclamation point icon at the bottom of the date/time display in the upper right of the screen, or by using the hotkey F. Quests are listed in the journal by title, and each quest can be expanded to read the text and requirements for completion. 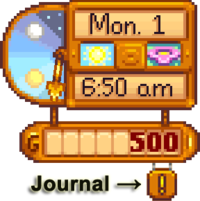 Clicking the X at the top of the window will close it and there's a button under the journal window to cancel the selected quest. There are two major types of quests, story quests and Help Wanted quests. Story quests are typically received in the mail, but a few are automatically accepted at the beginning of the game to help teach the player about the game. Story quests can be completed at any time after receiving them, there is no time limit or expiration date. Every day the bulletin board outside Pierre's General Store may have a randomly generated Help Wanted quest that you can complete in exchange for money and sometimes increased friendship with the quest giver. When a new quest is available, the bulletin board will have a yellow exclamation point floating above it. Rewarded money depends on the number of items/monsters involved, the player's skills, and sometimes a bit of randomness. Once you have accepted a Help Wanted quest you will have 2 days to complete it, the current day and the next. If a daytime festival occurs during the 2-day period, you may be unable to complete the quest on the festival day, since most shops and homes are "locked". See the Shop Schedules page for more information. There are 2 Achievements associating with completing Help Wanted Quests. Earning these achievements unlocks unique Hats at the Abandoned House in Cindersap Forest. In addition, the day after earning "Gofer", Mayor Lewis will send 500g in the mail. The day after earning "A Big Help", Mayor Lewis will send 2,500g in the mail. Gathering Clint will ask you collect copper, iron, or gold ores, usually 20-40, or coal for him to inspect, or Robin will ask you to gather wood or stone. Note that it is not necessary to have the requested items in inventory to complete a gathering quest. Once the required number of items have been gathered (as indicated by the counter in the journal), simply talking to the villager who requested the items is sufficient to complete the quest. Slay Monsters Requires access to The Mines. Clint, Lewis, Demetrius, or the Wizard will ask you to slay a random number of a specific monster. Once the required number of monsters have been slain (as indicated by the counter in the journal), talking to the villager who made the request will complete it. Fishing Demetrius or Willy will ask you to catch from 1-5 of a specific fish from the current season, either to lower the population of that fish or to keep the art of fishing alive. The reward is the base sell price of the fish × the number of fish requested, and you get to keep the fish. Note that it is not necessary to have the requested fish in inventory to complete a fishing quest. Once the required number of fish have been caught (as indicated by the counter in the journal), talking to the villager who made the request will complete it. Item Delivery This is the most common type of Help Wanted quest. Any adult villager that the player has met and can earn friendship with will ask for a random item for various reasons. Villagers will reward the player with three times the item's normal value, which may make Item Delivery quests a more efficient method of earning money from lower value items than shipping them. The player also earns 150 Friendship points with the requesting villager for completing the quest. To complete an Item Delivery quest, it is necessary to hand the item to the requestor. Simply having the item in inventory when talking to the requestor will not complete the quest. Note that completing an Item Delivery quest does not count as giving a gift. Note: Jas, Vincent, Krobus, the Dwarf, and your spouse will never make Delivery requests. Sandy will make Delivery requests once you have access to The Desert. Bug: The text of a Help Wanted quest may read "Buying 1 <item> at twice the market value!" This is a bug because the reward is always 3× the market value. In addition to quests posted on the "Help Wanted" board, there are several Story Quests unlocked during gameplay. There is no penalty for accepting a Story Quest involving item delivery and then deleting it from your journal without completing it. Story Quests do not count towards the "Gofer" or "A Big Help" Achievements. Note that the game adds 255 Friendship points for quests that say "1 Friendship heart", rather than exactly 250 points. Raising Animals Robin, the local carpenter, lives north of town. In exchange for raw materials and money, she'll construct new buildings on your farm. You'll need her to build a coop or barn so that you can raise animals. Complete "Getting Started" Build a Coop. Explore The Mine There's an old mine shaft in the mountains north of town. There could be valuable minerals inside, but Marlon hinted that it might be dangerous. Enter The Mines. Reach level 5 in The Mines. Deeper In The Mine It seems that the mine elevator is still functional. It will allow you to quickly return to any elevator doors you've discovered. A deeper expedition might be in order. Reach level 5 in The Mines. Reach level 40 in The Mines. To The Bottom? So far, there's no sign of the bottom. How low does it go? Reach level 40 in The Mines. Reach the bottom of The Mines. Rat Problem There's something odd going on in the Community Center... Investigate the Community Center Trigger the initial Community Center cutscene by entering Pelican Town from the Bus Stop between 8am and 1pm on a sunny day (Spring 5+) Enter the Community Center and examine the Golden Scroll in the Crafts Room. The following morning, a letter from the Wizard arrives in the mail, triggering the "Meet the Wizard" quest. Meet the Wizard You received a letter from the local wizard. He claims to have information regarding the old community center. The morning after you examine the first golden scroll in the Community Center, you receive a letter from the Wizard saying he has information for you. Enter the wizard's tower. The Wizard gives you a potion that allows you to read the language of the Junimos. Smelting Now that you've built a furnace, you can smelt some metal. According to Clint's instructions, if you place 5 copper ore and 1 piece of coal in the furnace, it should produce a copper bar. Complete "Forging Ahead" Use your furnace to smelt a copper bar. NOTE: In some cases, the quest will become bugged and read "slimes" but the actual monster that must be killed to satisfy the quest is a different monster (most commonly a Rock Crab, but may be another monster). One theory for explaining this bug is that the first monster killed becomes the monster that must actually be killed to satisfy the quest. The Mysterious Qi Within a secret lock-box, you found a note with peculiar instructions. It's signed by a 'Mr. Qi'. Put a Battery Pack in the lock-box in the tunnel next to the bus stop. Leave a Rainbow Shell in the box at the train platform. You found another note written by 'Mr. Qi'. The request is even more unusual this time. Complete "The Mysterious Qi" first quest Place 10 beets inside Mayor Lewis' fridge. You found another note in the sand dragon's eye. It seems Mr. Qi's strange scavenger hunt has come to an end. Complete "The Mysterious Qi" third quest Inspect the lumber pile beside your house. Club Card, which gives you access to the Casino in Oasis. Cryptic Note You found a note that reads, "Someone is waiting for you on level 100 in the Skull Cavern" Reading Secret Note #10 Reach level 100 of the Skull Cavern Mr. Qi awards you with "iridium snake milk", which permanently increases Health by 25 points. Note that the mail request states the reward will be 1,000g, but fulfulling the quest rewards the player with only 750g. Goblin Problem There's a goblin blocking the path to the Witch's hut. There must be some way to get him to move... Perhaps I should seek out more information on Goblins. Through the cave by the Railroad after completing the Dark Talisman quest. Speak to the Henchman outside the Witch's hut and give him Void Mayonnaise as a gift. Take the Magic Ink from the Witch's Hut and give it to the Wizard. Wizard buildings available. Dark shrines now accessible in Witch's Hut. Gathering quests can be completed using fewer than the required item, and/or by using items already in inventory before accepting the quest. Note that these exploits do not work for Fishing quests. Cheat #1: If you place the items in a chest and remove them one-by-one (by right-clicking), they will count towards the quest. Even one item can be placed in a chest and removed repeatedly to satisfy the quest requirements. Cheat #2: Separate part of a stack of the required item in inventory by right clicking on it, leaving at least one in each stack. Then select one stack, and click outside the inventory window (not on the trashcan) to drop one of the stacks on the ground. It will be immediately taken back into inventory, and then be counted towards the quest. Repeat this process until the journal indicates that the required number of items have been gathered. There is an unimplemented quest reward in Data/Mail.xnb indicating Mayor Lewis would send you 10,000g, apparently after completing 100 Help Wanted quests. If you decide to purchase Joja Cola instead of Fishing for it, the cost for one can is 75g, exactly the same as the reward the NPC will give you. Therefore, it will net you 0 gold, although it might still be beneficial to do it for friendship points. On the day you first enter the Skull Cavern, Mr. Qi's Challenge quest will not have been initiated, since that occurs by mail the day after you enter the cavern. If you begin mining on that first day and manage to descend to level 25 or beyond, the game will not credit you with having achieved the challenge quest. You must reach level 25 again in order to fulfill it. 1.3: Added 3 quests related to Secret Notes: A Winter Mystery, Strange Note, and Cryptic Note. This page was last modified on 19 April 2019, at 22:58.